I learned to read when I was four years old, a source of immense pride for my mother. I’m not sure if it was because I was so young or because of how painstaking her efforts were. But I remember feeling a mixture of joy and embarrassment as I sounded out the headlines my mother pointed to in a newspaper. I didn’t always know what the words meant, but I could pronounce them. I was often forced to perform this in front audiences that were too polite to say that it was the most boring show ever. When I eventually started reading for pleasure and not just for dazzling crowds (my apologies to whoever those unfortunate people were), it became a huge part of my life. My mom was not only an advocate of early literacy but also a thrifty immigrant from Pakistan. She’d quickly figured out that the public library system provided hours of free entertainment for her children, so she took us to the Rockville Library every few weeks. In the summer, we’d take brown bags from the grocery store and fill them up with books. That was our version of summer camp. I read everything—science fiction, mystery, adventure, and fantasy. But the stories I loved the most were the ones about family and friendship and little girls I could relate to, like Ramona Quimby, Laura Ingalls Wilder, and Jo March. At that time, no one was talking about diversity in children’s literature. As I look back now, I’m aware that I wasn’t reflected in the stories I read. I certainly didn’t encounter any characters that resembled me, a shy Pakistani-American Muslim girl. But I still found something to connect with in each of the characters I loved, and even now, I consider them to be old friends. Like many writers, in addition to reading a lot, I was compelled to write as a child. I wrote poems, mock television shows, and a family newspaper, which I named The Khanicles. I dug up old issues recently, yellowed sheets of ruled paper filled with my crooked handwriting. As I reread the articles, I recalled feeling guilty when I embellished a story or took creative liberties. It was supposed to be hard journalism, and there was no such thing as fake news back then. What’s noticeably absent is any mention of my culture, religion, or anything that made my family different from the ones I read about in my piles of books. There’s no mention of my mother’s flowing shalwar kameez, the smell of onions and masala that permeated my own clothes, my weekly visits to Islamic school, or the Urdu language we spoke at home. I had whitewashed myself subconsciously. On some level, I must have thought that it was necessary to be white to be worthy of publication. My story, what made my family and me unique and colorful, simply didn’t matter enough to put into print. Considering what I had been exposed to, why would I think otherwise? I was the only Muslim in my class—maybe even in my entire school—and although I went caroling with my friends every Christmas and nibbled on Matzah during Passover, no one had ever heard of Ramadan or Eid. Many of my peers hadn’t even heard of Muslims or Islam or Pakistan. Like any other kid, I was trying to fit in. So I kept my mouth shut and read about characters that resembled my friends and shared in their celebrations. I can only imagine what it would have felt like to have picked up a book that actually did reflect my life with characters that did represent my world. How might that have shaped me and added to my self-esteem? What about all the other kids like me? As a child of immigrants, I inevitably struggled to balance being American and respecting the culture my parents brought to this country, a precarious position further complicated by the fact that my parents didn’t quite get it. “Why don’t you be a Pakistani princess?” my mother suggested every Halloween, hoping to recycle my fancy Eid clothes instead of splurging on one of those drugstore costumes that was little more than a printed trash bag. I preferred to wear the latter, even if the cheap mask broke halfway through trick-or-treating. The last thing I wanted was to be a Pakistani princess. First of all, there was no such thing, as far as I was concerned. I’d never heard of, read about, or seen a brown or Muslim princess. Second, I didn’t want to have to face my neighbors’ extra interest in me and answer the innocent question, “What are you supposed to be?” It was hard enough that I had to try to answer that question myself every day. After I became a mother in 2001, I happily bought lion, dragon, and Power Rangers Halloween costumes for my son. I also took him to the library and the bookstore and searched for books that reflected him. I couldn’t find any. We had a small collection of books by Muslim publishers on how to practice our faith, but they were often didactic, poorly written, or badly illustrated. I grew increasingly jealous of the gorgeous picture books I found about other cultures—Sammy Spider teaching kids about Hannukah as he watched a family spin a dreidel, Henry celebrating his first-moon birthday, Nanita learning how to make flan. Where were the books about Muslim kids? Where were our traditions and holidays? I realized that we desperately needed these stories, not only so my son and other Muslim kids could see themselves in the literature, but also so non-Muslim kids could learn about our culture and faith. In a post-9/11 America, people were more curious than ever about us. And unfortunately, even though it took years to firmly take root, the seeds of Islamophobia had been planted. For better or worse, growing up wouldn’t be the same for my children as it was for me. When I was in second grade, the closest thing to anti-Muslim sentiment that I experienced occurred during the Iran hostage crisis. Kids counted on their fingers, “I walk, I run, I RAN,” ending on their middle finger. Even though I wasn’t Iranian and didn’t understand politics, I remember feeling weird about the fact that Muslim people were the ones in the evening news doing bad things. But Islam itself wasn’t being presented as the enemy. Instead it was fundamentalists, political extremists, a fringe minority. That, as we all know, has changed in today’s climate. Today, my kids are growing up in the same part of Maryland that I did. Their elementary school honors diversity with slogans like “many cultures, one community,” hosts international nights, and for the first time ever, our county included Eid on the school calendar. It was a huge step toward inclusion, and we were overjoyed. Unlike when I was little, everyone has heard of Islam, Muslims, and Pakistan. And there are lovely, multicultural books about Islam for my children and others to share at school or find in the library, including the ones I’ve published. On the flip side, my kids are growing up in a 24-hour news cycle where they constantly hear negative things about their faith. Our new President has even claimed that “Islam hates us.” Since the damaging rhetoric of the election cycle, it has somehow become okay to demonize a faith practiced by 1.7 billion people because of the horrific acts of a small number of radical extremists, and bullying and hate crimes against the American Muslim community have been on the rise. People are being fed lies about mosques being breeding grounds for terrorists or hotbeds for “creeping Sharia.” It’s disappointing but not surprising that mosque vandalism and attacks have increased exponentially. It’s an extremely challenging time for American Muslims in general and our children in particular. There’s increasing data on the negative impact of the current climate and a never-ending stream of heartbreaking anecdotal evidence. Every day, I hear distressing news about little girls having their scarves pulled off or kids being afraid to admit they are Muslim, being taunted and called “terrorist” or “ISIS,” and even questioning if they can be both Muslim and American. When I think back to my mother pointing at headlines and having me read them aloud, I wonder if she would still do that today. At times, I even wish that my younger son didn’t know how to read yet. I hide the paper and the horrible headlines exclaiming about terrorist attacks, Muslim bans, internment camps, and so on. At the same time, I know we can’t escape the reality we live in or shelter our kids completely. One thing we can do is to offer alternative narratives (not to be confused with alternative facts). Let our children find themselves in stories, where they can see themselves as complex and nuanced characters that don’t reflect stereotypes. Let’s give them protagonists who resemble them, who they can root for—a shy Pakistani-American Muslim girl, or a brown princess, or a kid who just wants to play basketball. Let’s make sure these characters reflect the entirety of the Muslim community in America—hailing from all races, ethnicities, sects, economic and geographic backgrounds, and genders. Let these characters be as confused as the rest of us about what’s happening in the world, what to wear on Halloween, and other normal, relatable kid stuff. And through their stories, let them believe that they are nothing less than worthy of them. At the same time, let’s give all Americans a chance to get to know a Muslim, or two, or several hundred, through our stories, our books, podcasts, blogs, films and visual art. If 60 percent of Americans say they don’t know a Muslim personally or don’t have a Muslim friend, they can be more easily misled into believing that Muslims are a monolith. They can fall victim to not being able to distinguish between fake and real news. And, in all fairness, they can confuse the violent extremism that masquerades as Islam for the religion practiced by over a billion peace-loving people around the globe. 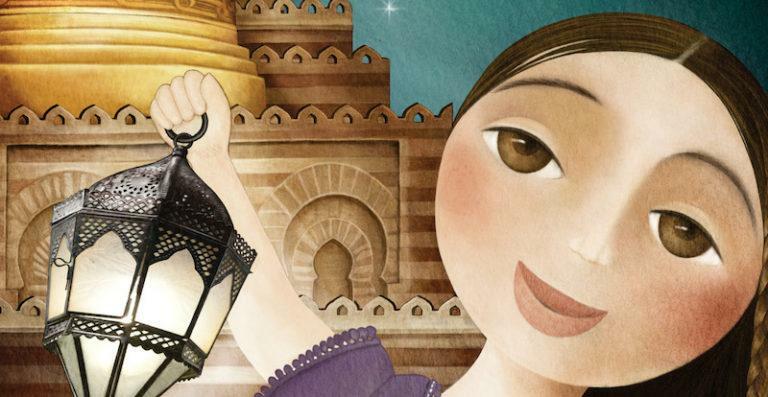 If readers get to know Muslim characters through stories, perhaps they will come to think of them as friends. Perhaps they will feel compassion toward them and gain tolerance. And perhaps they will keep them in mind, no matter what the headlines say.